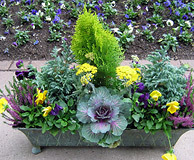 We are pleased to offer a variety of ready-made containers, or you can use our Potting Shed, bring your own containers and create your own colorful masterpiece. If you like, you can drop your containers off or we’ll pick them up and freshen up your containers and return them to you. Give us a call or check with us when you’re in.